Performance is a big deal for most people when it comes to their PC. There are a lot of little tweaks you can do to squeeze just a little more from your Windows 7 PC. But can you really be sure what you did is making a difference? Windows 7 and Windows 8 have a feature called ReadyBoost. ReadyBoost lets you use a flash drive to improve the speed & performance of your Windows 7 PC. When you have your USB flash drive set up to use ReadyBoost, you can monitor what it is doing with a feature built into Windows 7. 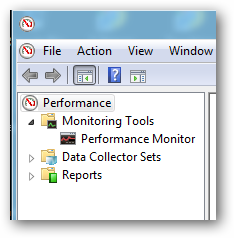 If you weren’t aware, there is a Performance Monitor tucked away ready to be used to monitor your computer’s goings on. Below is a quick walk-through on what the Windows Performance Monitor can do and how to set it up to check out how your ReadyBoost drive is working. 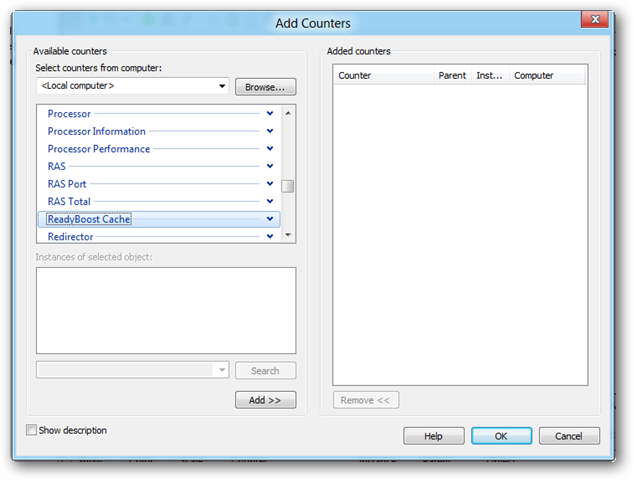 Finding the built-in Performance monitor is a simple search away. You will need to click on the Start icon and type “perfmon” into the search box. The picture below is from Windows 8. 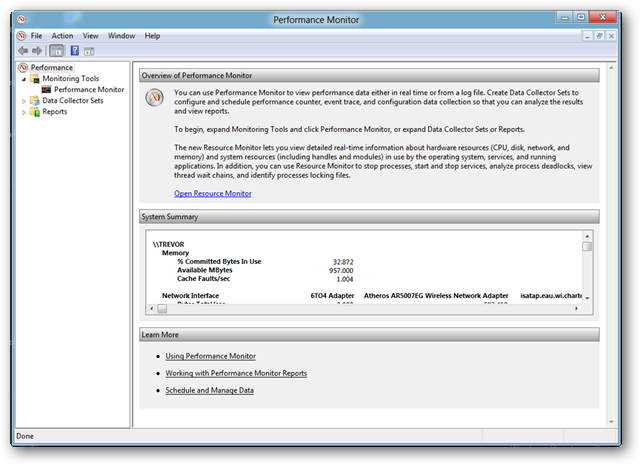 You can follow the same process in Windows 7 and access the Windows Performance Monitor. When you open Windows Performance Monitor, you will see a screen something like this. This is the main performance window. To get to the monitor, click on Performance Monitor. If you do not see it right away, you may need to click on Monitoring Tools then Performance Monitor. After you are in the Performance Monitor screen, you will need to set it up to display what is happening with your ReadyBoost USB drive. To do this, you must click on the big red X to stop the current monitoring. Then click the green “+” (plus sign). A window will pop-up like this. Scroll down until you see ReadyBoost and click on it to highlight it. When highlighted, click the add button below. You can then hit the OK button. What should happen is the Performance Monitor will start graphing the what is happening with your ReadyBoost USB drive. 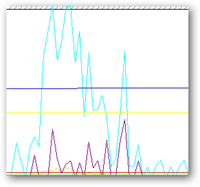 If the drive is not being used, the graph will look like this. 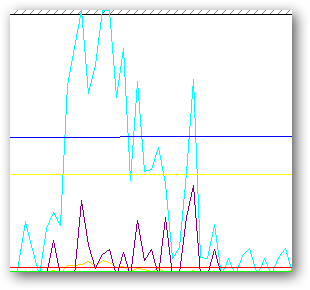 When there is a lot of usage, you should see all kinds of peaks and valleys in the lines. I think if you are the kind of person who likes to know what their computer is doing, you will likely spend some time looking into how different tasks affect the performance of your PC. The usual suspects like video and streaming media add stress to your system, but what other unlikely apps may be slowing down your PC? Windows Performance Manager can help you find out.